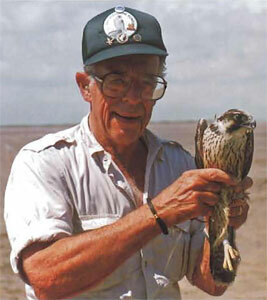 The Peregrine Fund mourns the passing in 2005 of an old friend and falconer, T. Halter Cunningham. Although many of us knew him for his longtime dedication as a member of our Board of Directors, his involvement with raptors stretches back to his years as a teenager in Chevy Chase, MD. Halter was a neighborhood friend of Frank and John Craighead (now considered among the "founding fathers" of falconry in the United States). Peregrines migrated then, as now, along the Atlantic coast, and Assateague Island was a favorite trapping spot of falconers. They buried themselves in the sand, holding a pigeon to bait passing falcons. Halter had homemade perches for his falcons in the back yard and trained them to hunt in nearby open fields, releasing them when it was time to migrate again. In later years, he and his friend Brian McDonald developed the pigeon harness, a leather harness with several slipknots of fishing line sewn on. Once the pigeon was harnessed, it was released with a long cord attached. When a falcon snatched the pigeon, its talons were caught in the slip knots and the falconer could then capture the falcon and train it. One of Halter's pigeon harnesses was bestowed to The Archives of Falconry along with numerous other artifacts by his son, Tom. In an article co-authored with William F. Turner in the September 1947 issue of Hunting and Fishing magazine, Halter (a.k.a. "Dusty") explained falconry and falcons to the layman, calling the Peregrine Falcon "the finest thing that wears feathers." "To look in on [the nest of] one of these rare birds:” he continued, "requires the following: a strong pair of legs, a broad back, a long rope, and not too much regard for your future." Apparently Halter possessed all those traits, and he applied them in other areas besides falconry. The day after Pearl Harbor was attacked, Halter enlisted in the Marines and was in the first wave to land on Guadalcanal. He was awarded the Purple Heart for battle wounds he received there. He worked as a game warden on the Chesapeake Bay after the war, then took over his family's business, Lanman Engraving Company. With Halter at the helm, the company became the largest privately owned pre-press and commercial printing business in the eastern U.S., providing work for major entities including Smithsonian Magazine, National Geographic, and Disney. Among his lifelong passions, Halter included polo, fishing, and duck hunting; and, to the benefit of wildlife conservation, his passion for raptors never waned. Even in his mid-70s, Halter accompanied other board members of The Peregrine Fund on Peregrine monitoring expeditions at South Padre Island, Texas. If we had our money back that we have spent chasing these fool birds from coast to coast, we could probably retire; but if we tried to place a value on the experiences that Falconry has afforded us, we don't think a million dollars would cover it. For the conservation-minded reader, remember that a lad who spends his time in the pursuit of hawking will save many more birds than he will kill, for through constant contact with wild things a fellow must learn to love them. We have acquired an intimate knowledge not onlyof birds of prey, but of nature in general, which is of incalculable value, both physically and spiritually.